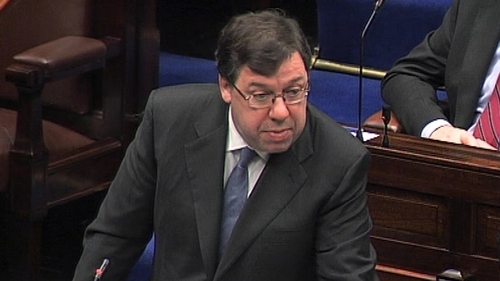 Taoiseach Brian Cowen has told the Dáil that he rejects what he called the ‘absurd conspiracy theory’ being put forward by the Opposition in relation to his contacts with the former chairman of Anglo Irish Bank, Seán FitzPatrick. Mr Cowen denied suggestions that he acted improperly, and said subsequent Government decisions on the bank guarantee scheme were taken objectively and did not favour any institution. The Taoiseach repeated that at no time during a game of golf in July 2008 with Mr Fitzpatrick was Anglo Irish Bank discussed. It was also disclosed that after playing golf, they were joined by four other guests, including another Anglo Irish Bank Director Gary McGann. However, Mr Cowen claimedhe said he did not have any closer relationship with former Mr FitzPatrick than he would have had with the chairmen of Ireland's other large banks. He repeated that at no time during the golf game was Anglo discussed. He said he had no reason to say otherwise. 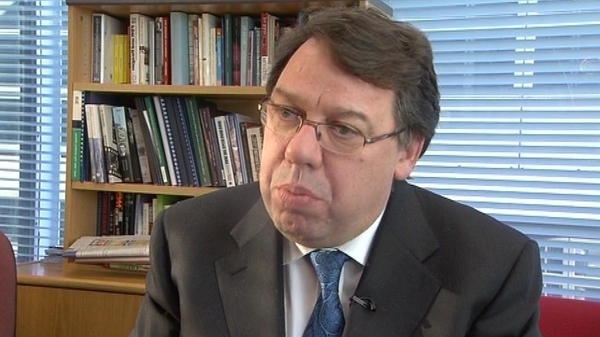 Mr Cowen was responding to questions from Fine Gael leader Enda Kenny, who asked the Taoiseach if this was the totality of the social and business contacts that Mr Cowen had with Mr Fitzpatrick. The Taoiseach addressed Labour Party Eamon Gilmore directly, saying he was not an economic traitor and said there was no basis in fact for the contention. Mr Gilmore rejected that he ever made a personal attack on the Taoiseach. He said if Mr Cowen knew that Anglo was insolvent, then that was economic treason and he would stand over that comment that he made some months ago. The Government has published the list of legislation it hopes to get through the Oireachtas before the General Election is called. Chief Whip John Curran said the Government parties were committed to enacting the Finance Bill, as well as other pieces of legislation arising from the Budget. These include the Public Service Pensions (Single Scheme) Bill, which establishes new pension arrangements for new public servants, the Betting (Amendment) Bill, to bring internet betting within existing regulations, and the Social Welfare (Miscellaneous Provisions) Bill, which will introduce PRSI changes announced in the Budget. There are also a number of other measures the Government hopes to bring through, if there is enough time. These include Green Party priorities, such as the Climate Change Bill, the legislation providing for a directly elected mayor of Dublin, new legislation on corporate donations, and the Environment (Miscellaneous Provisions) Bill, which introduces new levies on waste incineration. Other Bills yet to be published, which the Government hopes to introduce, include an amendment to the NAMA legislation to allow for the transfer of loans worth less than €20m from AIB and Bank of Ireland to NAMA, as well as a Bill on white collar crime. In addition to these new pieces of legislation, there are also a range of other measures already on their way through the Oireachtas, which may or may not become law, depending on the time available. These include the Student Support Bill, the Multi-Units Development Bill, and the Defence of the Dwelling Bill.